Do you need to get it right, too? Then, learn from Google. 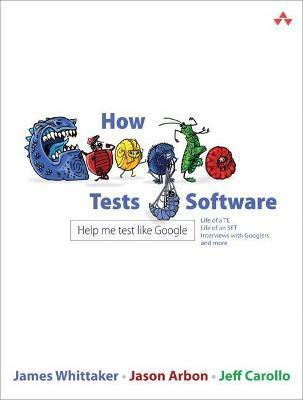 Legendary testing expert James Whittaker, until recently a Google testing leader, and two top Google experts reveal exactly how Google tests software, offering brand-new best practices you can use even if you're not quite Google's size...yet! Discover 100% practical, amazingly scalable techniques for analyzing risk and planning tests...thinking like real users...implementing exploratory, black box, white box, and acceptance testing...getting usable feedback...tracking issues...choosing and creating tools...testing "Docs & Mocks," interfaces, classes, modules, libraries, binaries, services, and infrastructure...reviewing code and refactoring...using test hooks, presubmit scripts, queues, continuous builds, and more. With these techniques, you can transform testing from a bottleneck into an accelerator-and make your whole organization more productive! James Whittaker is an engineering director at Google and has been responsible for testing Chrome, maps, and Google web apps. He used to work for Microsoft and was a professor before that. James is one of the best-known names in testing the world over. Jason Arbon is a test engineer at Google and has been responsible for testing Google Desktop, Chrome, and Chrome OS. He also served as development lead for an array of open-source test tools and personalization experiments. He worked at Microsoft prior to joining Google. Jeff Carollo is a software engineer in test at Google and has been responsible for testing Google Voice, Toolbar, Chrome, and Chrome OS. He has consulted with dozens of internal Google development teams helping them improve initial code quality. He converted to a software engineer in 2010 and leads development of Google+ APIs. He also worked at Microsoft prior to joining Google."